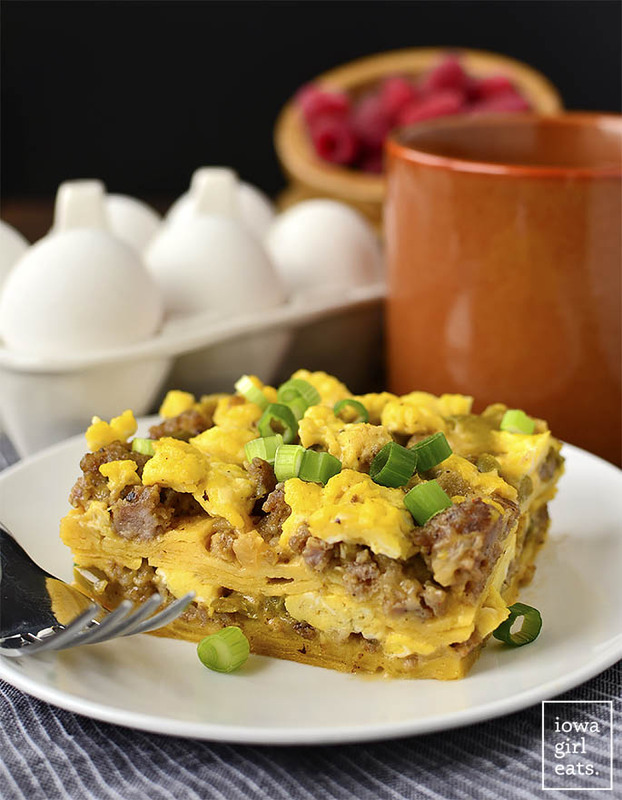 Breakfast Taco Casserole is layers of breakfast taco ingredients baked in an easy-to-eat, satisfying casserole. 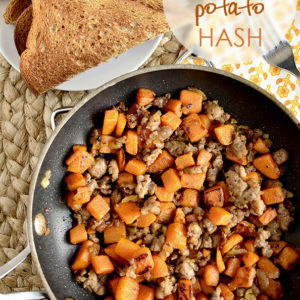 This gluten-free breakfast recipe reheats wonderfully, too! It feels like everyone I know has been to Austin, TX sometime in the past 6 months and the taco shots they’ve been sharing on Instagram are killing me! Chicken tacos, pork tacos, jack fruit tacos, and – oh yes – breakfast tacos. GIMME. That is to say, I love, love, love tacos but the breakfast ones in particular aren’t exactly wild mornings + 2 young children-friendly. Eventually I’ll get to a place where I can sit down and enjoy a nice taco or two at 8am in the morning (I think…I hope?) 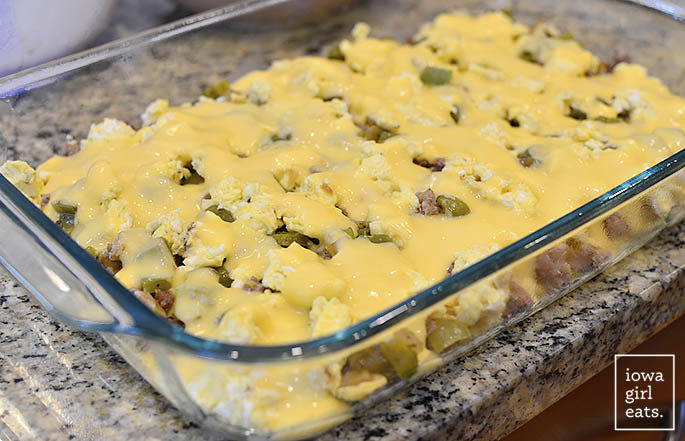 but for now I’m layering all the classic breakfast taco ingredients in a casserole dish, dousing them with homemade cheese sauce, and calling it a day. Or rather, breakfast. 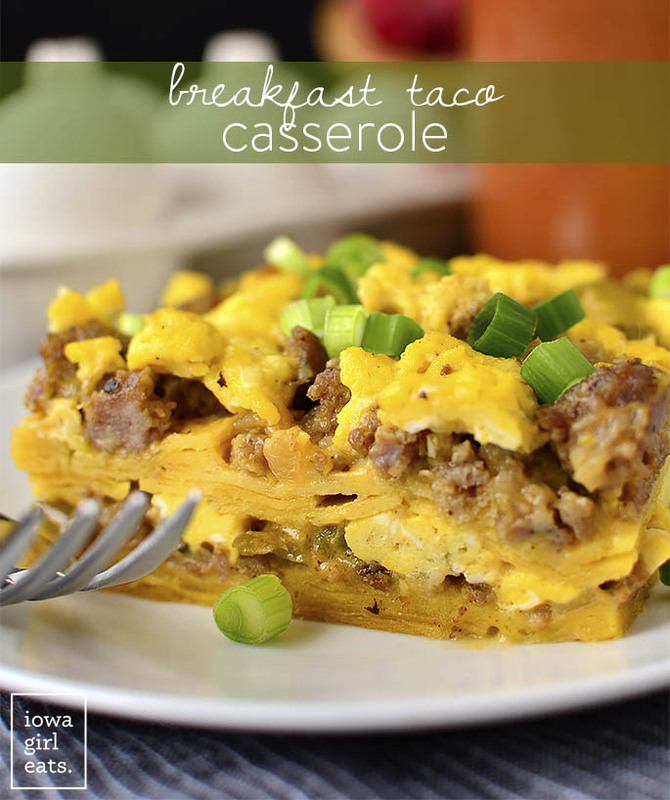 Make that lunch, dinner, and every meal in between – I have been eating Breakfast Taco Casserole at all hours of the day lately! This dish is TOPS. 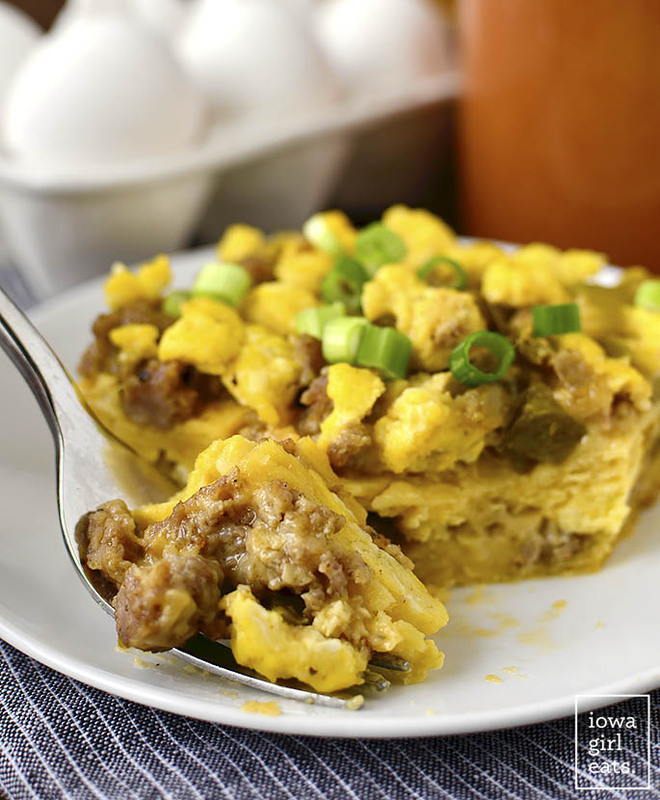 Check it out – cooked breakfast sausage, sauteed vegetables, and scrambled eggs are layered in a casserole dish with corn tortilla strips then drizzled with homemade cheese sauce and baked until bubbly. SO MONEY!!! 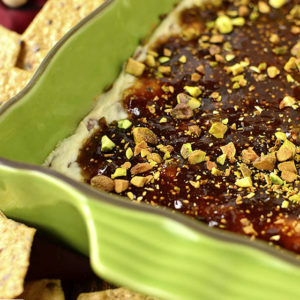 Not only is this dish absolutely delicious for a work potluck, holiday, etc, but it reheats wonderfully so you can assemble and bake on Sunday then reheat and eat for easy breakfasts all week long. The cheese sauce gets nice and saucy again after being warmed in the microwave and oh my gosh you just HAVE to try this. 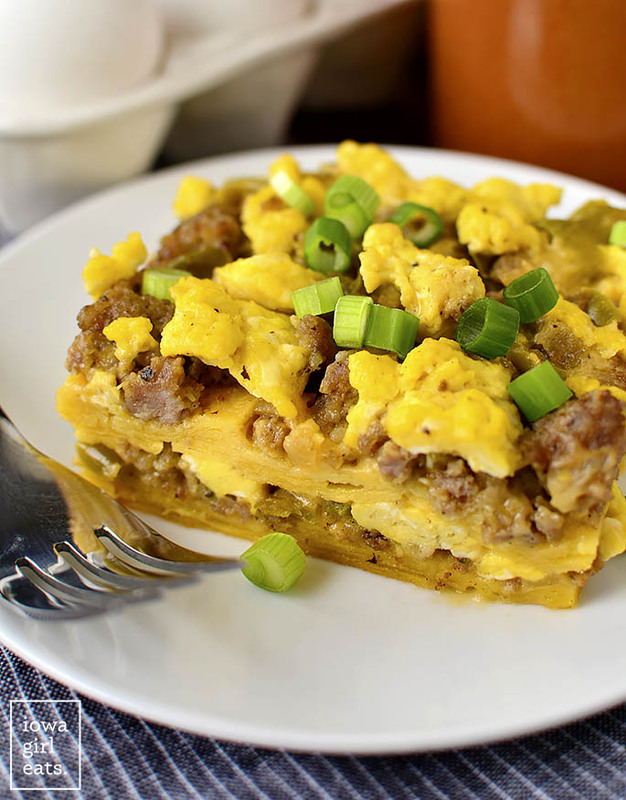 I was originally going to call this “Breakfast BURRITO Casserole” but Ben said nobody in their right mind would call a breakfasty dish with corn tortillas a burrito, and, ugh, I guess he’s right (hate when that happens.) I used gluten-free corn tortillas because, well, they’re gluten-free but also because I love how soft and creamy they get from the cheese sauce. That said, if you don’t need to worry about gluten and/or don’t like corn tortillas, you could try swapping them out for flour tortillas. 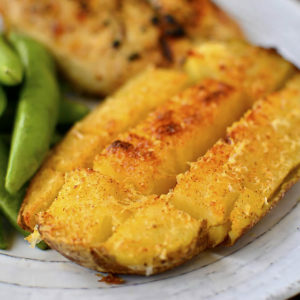 However you go about it, I know you’ll love this dish! 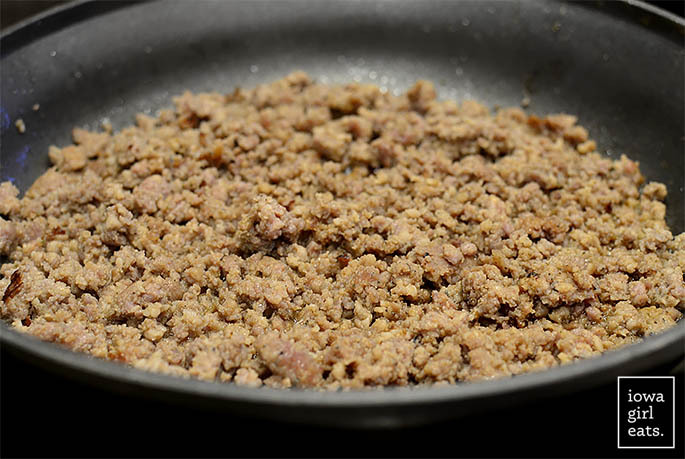 Start by browning 1lb gluten-free breakfast sausage in a large, 12″ skillet over medium-high heat, then scoop into a bowl and set aside. Next add a drizzle of extra virgin olive oil to the skillet then add 2 chopped green peppers and 1/2 chopped yellow onion. Season with salt and pepper then saute until tender, 8-10 minutes, turning the heat down slightly if the vegetables begin to burn. Scoop into a bowl then set aside. Turn the heat down to medium then add 8 large eggs that have been whisked with 1/4 cup milk (any kind – I used unsweetened almond milk,) salt, and pepper. Scramble just until they’re set then, you guessed it, scoop into a bowl or plate and set aside! Time for the cheese sauce – so easy and tasty! Melt 3 Tablespoons butter in a saucepan over medium heat then sprinkle in 3 Tablespoons gluten-free flour and whisk for 1 minute. Slowly stream in 2 cups milk (any kind – again, I used unsweetened almond milk,) while whisking to create a smooth sauce then turn the heat up slightly to bring the sauce to a bubble. Turn the heat back down to medium then stir until the sauce has slightly thickened, a couple minutes. Finally, remove the pan from the heat then add 8oz freshly shredded sharp cheddar cheese and stir until smooth. Season with salt to taste. Cheese sauce = done! 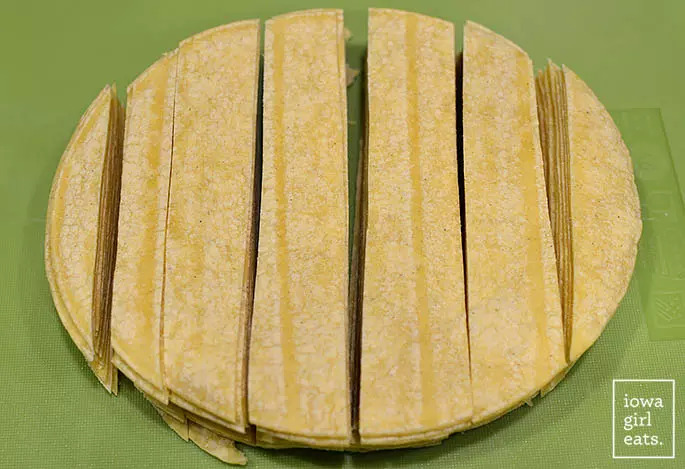 Last step is to slice 14, 6″ gluten-free yellow corn tortillas into 1″ (ish) strips. I used these Mission Yellow Corn Tortillas. Casserole assembly time! 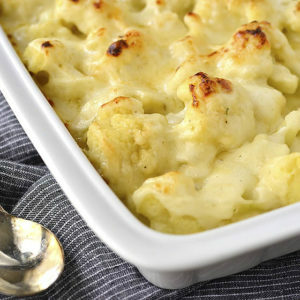 Spray a 9×13″ baking dish with nonstick spray then spread 3/4 cup cheese sauce in the bottom. Next add 1/2 the tortilla strips, 1/2 the sausage, 1/2 the vegetables, 1/2 the eggs, and 1/2 the remaining cheese sauce. Repeat the layers one more time then cover with nonstick sprayed foil and bake for 30 minutes at 400 degrees, or until the cheese sauce is bubbling. Let the casserole sit for 15 minutes before slicing and serving. I’m telling you – total breakfast epicness, right here my friend! Keep the leftover casserole in the fridge then slice, reheat, and eat for breakfasts all week long. Enjoy! Preheat oven to 400 degrees then spray a 9x13” baking dish with nonstick spray and set aside. Add eggs, milk, salt, and pepper to a large bowl then whisk to combine and set aside. 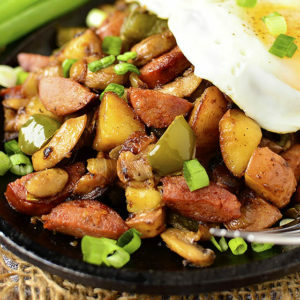 Add breakfast sausage to a large, 12” skillet over medium-high heat then brown. Remove to a plate then set aside. 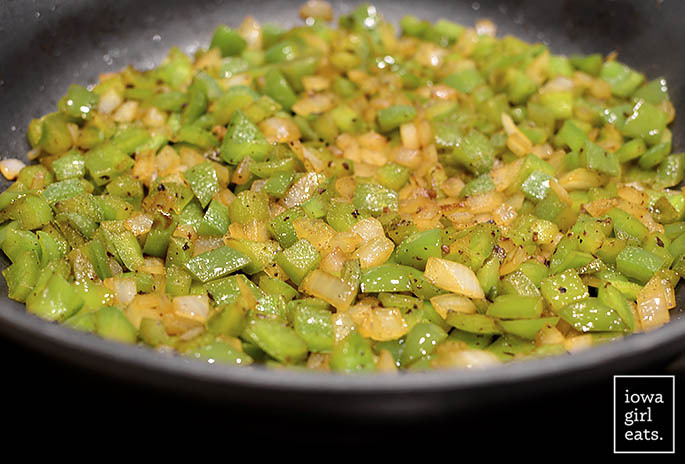 Add a drizzle of extra virgin olive oil to the skillet then add peppers and onions, season with salt and pepper, and then saute until the peppers are tender, 8-10 minutes, turning heat down slightly if vegetables begin to burn. Remove to a plate then set aside. 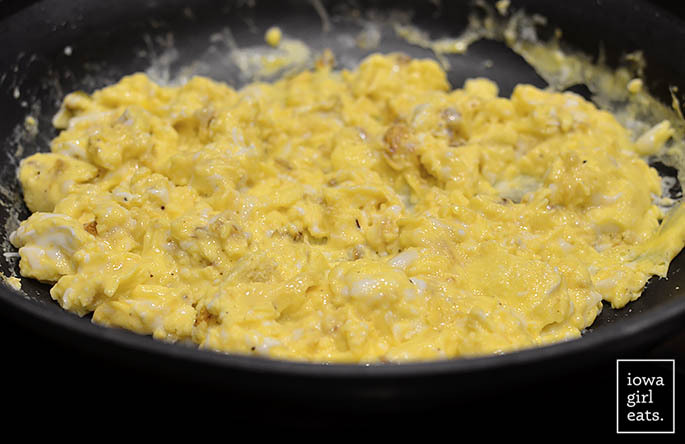 Turn heat down to medium them add whisked eggs to the skillet and scramble until set (do not overcook.) Remove to a plate then set aside. For the cheese sauce: Add butter to a medium-sized saucepan over medium heat. Sprinkle in flour then whisk for 1 minute. Slowly add milk while whisking constantly until smooth. Turn heat up slightly to bring sauce to a simmer while stirring frequently, then turn heat back down to medium and cook, stirring constantly until thickened, 2-3 minutes. Remove saucepan from heat then add shredded cheese and stir until smooth. Add salt to taste. Add 3/4 cup cheese sauce to the bottom of the baking dish then spread into an even layer. Add half the tortilla strips, half the cooked sausage, half the vegetables, half the scrambled eggs, and half the remaining cheese sauce. Repeat layers. Cover the baking dish with nonstick sprayed foil then bake for 30 minutes, or until cheese sauce is hot and bubbly. Let sit for 15 minutes before slicing and serving. Thanks for the recipe. Think I will try topping with salsa or taco sauce instead of the cheese sauce for a lower calorie meal, but definitely will try it out soon! Good idea! I hope you love it, Ashley! Oh my goodness!!!!!!!!! Why hadn’t I thought of this before?!?! Totally making it this weekend!!! Yay!! Let me know what you think, Angela! Looks so yummy!! I make hubby and myself tacos often. Promise it’s quick and easy. Stuff a tortilla with scrambled eggs, salsa and cheese (fresh cilantro when it’s in the fridge chopped)… so satisfying. Plain scrambled eggs for my two little ones. Your recipe says add th “scrambled” eggs, but do you mean beaten eggs? I just made this and as soon as I scrambled them in the pan I had the thought they should have been just beaten and added raw. It’s in the oven now, but I’m only cooking for half the time to hopefully not over cook the eggs. Nope you did it right! They’re scrambled in the skillet just until set ,then baked in the casserole. My most favorite is chicken tacos. Are you with me?? When I saw this Friday I just knew I had to make it ASAP. As a Texas girl, breakfast tacos are one of my all time favorite meals. I made this Sunday and all I have to say is you nailed it! This is fantastic. Yesss! Music to my ears – I’m so glad you loved it, Sarah! Any kind of taco, mexican food, anything is my favorite!!!!! Basically I wish cinco de mayo could be all year long! Awesome recipe! This was such a hit at a brunch I hosted yesterday! I added 505 Green Chile sauce to the cheese sauce and a can of diced green chilies to the pepper/onion mix. I also used half chorizo – half breakfast sausage. Phenomenal! Love the additions – I will definitely have to try that. I was thinking a chopped jalapeno would be really good in the vegetable mix – would give it that spicy nacho cheese kind of taste! Hello there! I’m a huge fan of ALL your recipes! Could you get most of this ready to roll the night before then just throw it in the oven in the AM? I wonder how much modification you’d have to make on the baking time…? Yes, absolutely, I’ve done it that way too! I cooked the sausage, vegetable, and egg components the night before, sliced the cheese and tortilla strips too. Right before assembling the next day I made the cheese sauce fresh. It came together really quickly and baking time was the exact same! 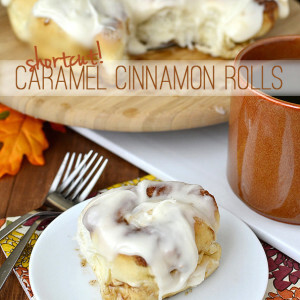 I made this Saturday and it will be a new staple in the breakfast lineup. My husband admitted he likes it better than my grandma’s egg casserole (sorry, Grandma!) And my toddler loves it too. Win-win! I made this last night and had it for breakfast this morning. It was AMAZING!!!!!! So glad you loved it, Sarah!! Thanks for the great feedback! Yeah slightly obsessing over here. I mean, another way to eat tacos? And first thing in the morning? Sign. Me. Up. I love tacos a lot and this recipe makes me so hungry. 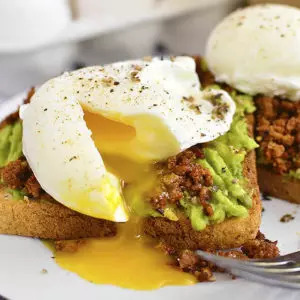 we all need a healthy breakfast so this recipe is perfect. I am sure that this recipe will be so healthy and tasty. I will surely try. Thanks for sharing your idea. Wow! I love this gluten-free breakfast recipe. I tell you that I will definitely try this. Hope it will be great. My cheese sauce was a bit runny. I’m not sure I added enough flour, but I still put it in to bake. Hoping it turned out ok. Some times I’m cooking impaired! I’ve made this several times…It’s amazing! I’ve also used Johnsonville Monterey and Chipotle chicken sausage in place of breakfast sausage and it was equally yummy. Yuuuuum – love that idea!! I’m so glad you loved it, Kayla, and thank you for the feedback! Made my day!! So glad to hear the whole family enjoyed!! We loved this recipe the first time I made it! About to make again for Christmas breakfast and wondering your thoughts on leaving the tortillas whole and layering instead of slicing into strips. Any watch-outs that I’m overlooking? Thanks! I think that would be ok! I worry a touch about the overlapping tortilla sections being a little bit harder then just a single layer, but I’m sure they’d steam and soften just fine inside the casserole.